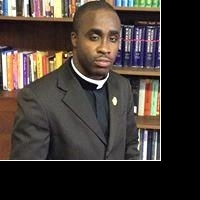 Reverend Eric Goode, a native of Duval County in Jacksonville, Florida, was born on December 2, 1986. When he was three years old, he was taken in by Bernice Hooper and the late Willie Hooper of Philadelphia. Reverend Goode was educated in the Philadelphia Public School System. He attended and graduated from the following schools: Morton Elementary School, Penrose Elementary School, Tilden Middle School, and Bartram High School. While in High School, Reverend Goode served on the Student Government Council. On October 15, 2004, Eric Goode preached his trial sermon and was licensed to preach the Gospel during the 4th Church Anniversary of the New Pentecost Christian Church, September 17, 2006. On the first Sunday of March, Eric Goode relocated back to New Hope Temple Baptist Church, under the pastorate of Reverend Dr. John Coger, where he served as the Youth Pastor. Reverend Eric Goode has participated in a number of activities during his college career. For instance, he served as Board member of the Community Involvement, and the Leadership Education Achievement Society Community College of Philadelphia. Reverend Goode served as President of the Christian Coalition Evangelistic Fellowship of Community College of Philadelphia. Finally, he served as an Associate Chaplin for Aristocare. Reverend Goode is a graduate with his Baccalaureate Degree in Pastoral Ministries from the Philadelphia Biblical University in May, 2012. Presently Reverend Goode is pursuing his Masters of Divinity with a concentration in Black Church Studies at Lutheran Theological Seminary. On March 22nd, 2014, Reverend Goode was elected the Pastor of The People’s Baptist Church in Philadelphia, PA. He was installed as Senior Pastor on Sunday, May 25th, 2014, where his aim is to carry on the Churches rich legacy of community service. Most of all, Reverend Eric Goode is child of God, who preaches the Gospel of Jesus Christ with power and conviction.